Yeah, it’s all the rage now. If you close your eyes and throw a stone, you’ll probably hit some Asian-Italian/ Japanese-Western/ French-Asian restaurant. That’s a little different, ‘innit? Once upon a time, there was a Chef named Kumi who journeyed to Hawaii and fell in love with the sunny tropical cuisine of the island. Fusing it with her traditional Japanese style of cooking, she now tantalises taste buds in many locations around the world, including the USA, Singapore and of course, KL. Wasabi has a nice contemporary feel to it, with modern décor and a distinct lack of the usual kitschy Japanese touches like bamboo fixtures and posters of Sake. 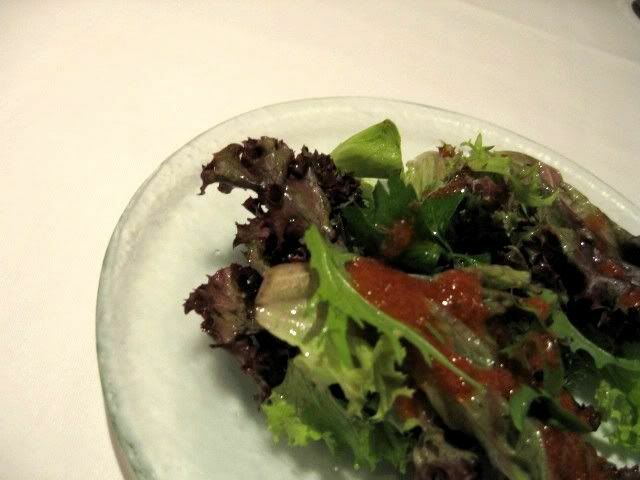 We were presented with a complimentary starter of fresh greens with a delicious tomato based dressing. I loved this salad! The dressing was tasty but not too overpowering and the greens were very fresh. 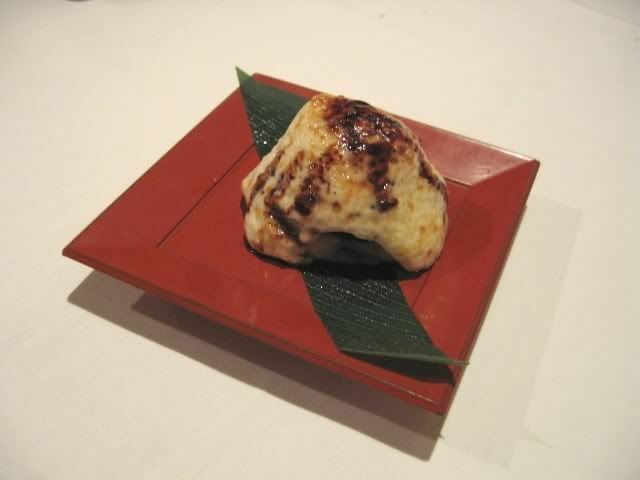 Moving on to the appetizer, we ordered the Chef’s specialty which is very modestly named Kumi’s No. 1. This dish (priced at about RM22 for two servings) has a strip of fish wrapped around a cube of avocado, topped with slices of crabstick and baked with cheese. 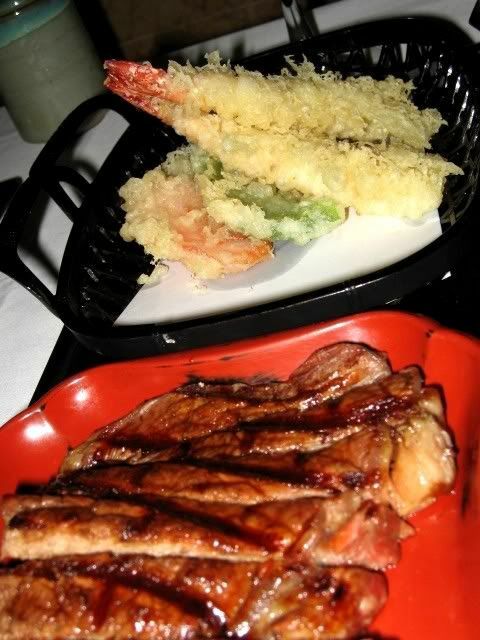 The tempura was ok and the beef was tasty, although a little overcooked on one end. We were told by the waitress that this set is constantly changed by the chef to keep things interesting. The only constant thing is that the main dish will always be some sort of fish, served with rice, soup, pickles and salad. 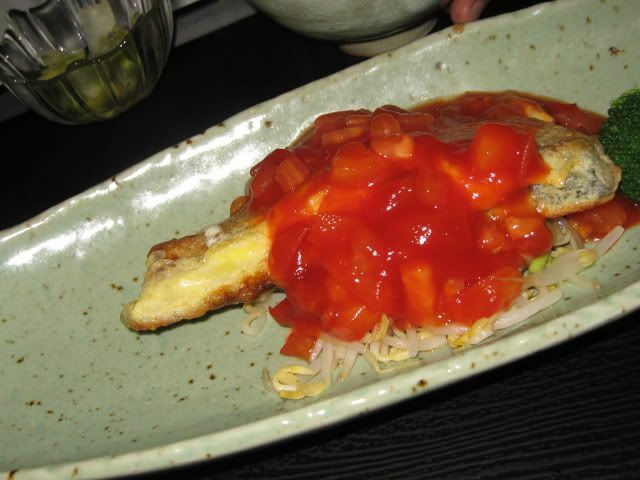 That day, the fish was a tender fish fillet coated with egg and served with a chunky sweet and sour sauce. By no means did it make any milestones in terms of originality but it tasted pretty good. 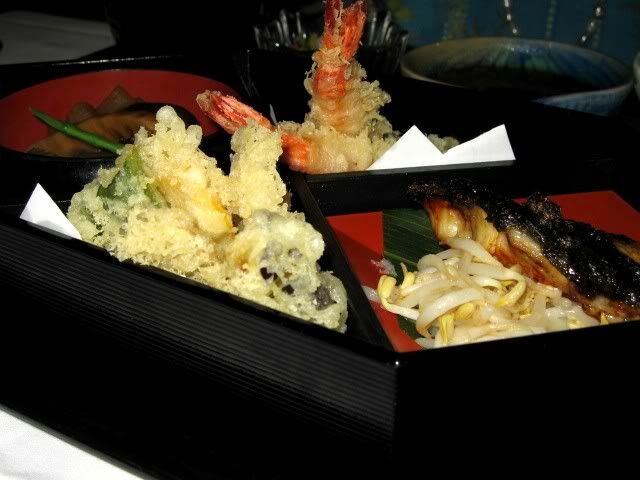 This Japanese box set comes served with mixed tempura, stew, salad, grilled cod and of course the usual rice, soup and pickles. The tempura, as before, is ok but the thing that stands out is the cod grilled to perfection with its crispy skin and soft, tender flesh. The highlight of the meal for me though was, as always, the dessert. The ice cream was presented very simply: just one lonely scoop in a plain white bowl with no toppings. 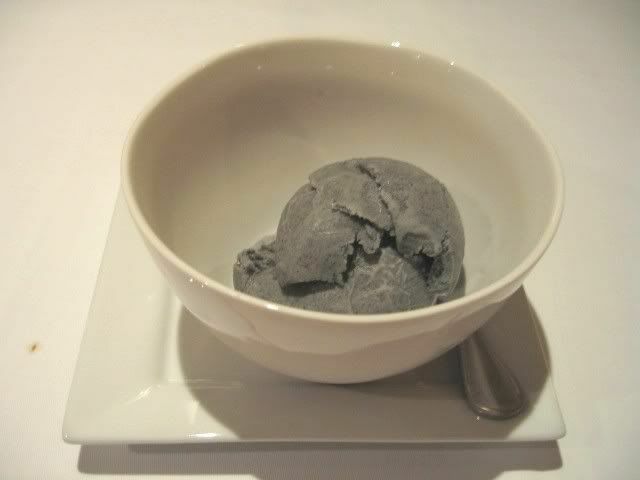 It tasted excellent though, as far as black sesame ice cream goes. Unlike some other places, the black sesame had been ground very finely so the ice cream was bursting with flavour and was smooth and creamy without having a grainy texture to it. It’s definitely something that I would try again… but only when I am feeling rich. At Wasabi, you must keep in mind that YES, the servings are tiny… and YES, you can get comparably tasty Japanese food else where, but as with any good restaurant in any good hotel, do remember that you are also paying for the ambience, exclusivity and service. 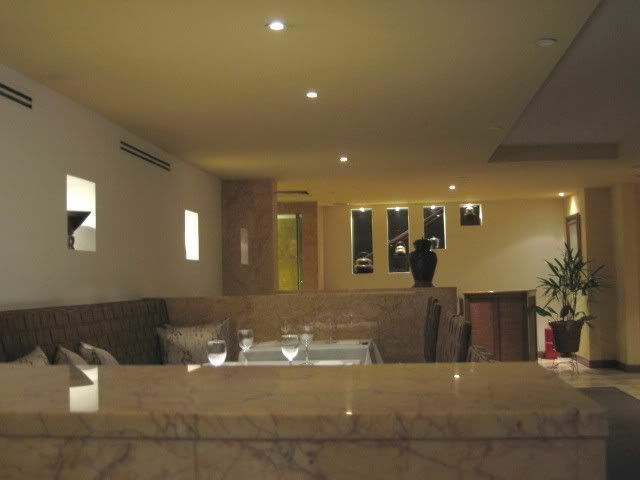 In fact, as far as hotel Japanese restaurants go, I think this has pretty good value for money (My point of comparison? 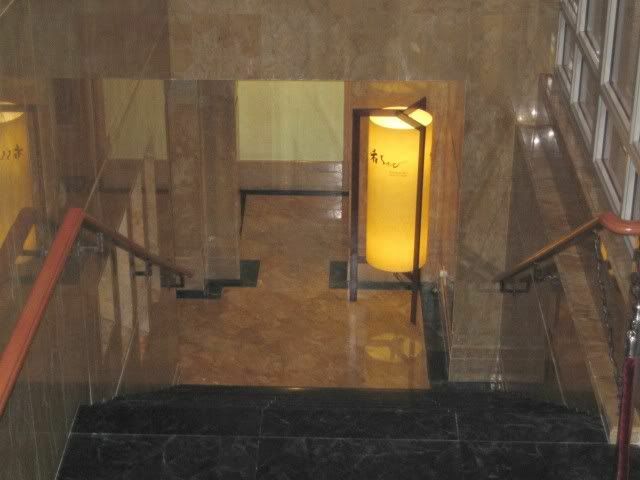 : Zipangu at the Shangri-la, KL – the food is great but prices are s-t-e-e-p). Another point to note is that overall, this restaurant has a mild, delicate taste for its dishes. This is ok for me but I know many people who would be happily dunking everything in soya sauce for that extra salty goodness.